When due to regular wear and tear or for any other reason your tooth’s health gets affected, your tooth can suffer from cracks, chips or discoloration. 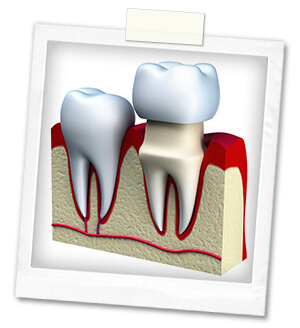 All such conditions cause damage to the surface (enamel) of your tooth. Such issues can be fixed with a ‘crown’. A crown is a custom-made tooth which can be bonded or cemented to the surface after reducing the original tooth. This procedure easily fixes the decay or damage to the surface of your tooth. We have the best technicians working to design and fashion a perfectly matching and natural looking crown for you in a dental laboratory. We use digital photography and microscopes to match the color of the crown with your surrounding teeth. However, for a greater level of damage which hurts the root (foundation) of your tooth, it is better to go for a bridge or a dental implant. Your dentist can advise you regarding the proper treatment option after assessing the condition of your tooth through an initial examination. You need strong crowns so it can function properly as tooth replacement for which it is essential that the natural tooth below the crown be reduced. To place the crown, there is a requirement for removal of any decay. Once through with this, your dentist will shape your tooth to prepare it for a crown placement. The crown is designed to be thick enough so it can properly aid in chewing. Construction of your permanent crown will begin based on an impression of your tooth taken by the dentist. The dentist will examine the fitting requirements and provide you a temporary crown till your permanent one becomes available. The permanent crown will be placed amongst your teeth and checked for proper fitting after removal of the temporary crown, on your second visit. Once your dentist is satisfied with the fitting, your permanent crown will be bonded or cemented in place, providing you with a naturally strong tooth that looks and functions like your original tooth did. Conventional alternatives to crowns and fillings are inlays and onlays, advised by dentists when more than half of your tooth is damaged. Inlays and onlays help by becoming effective replacements for the damaged structure of your tooth. The requirement of an inlay or an onlay will be decided depending upon the nature of damage. Inlays are ideal for minimal damage and onlays are recommended for extensive damages where crown replacement is not required. Made from porcelain, gold or composite resins, Inlays and onlays provide benefits of being stronger than blended-metal filling, thus providing better protection against further decay or damage. Inlays and onlays are bonded directly to the teeth. Inlays and onlays are constructed in a dental lab based on the impression your dentist takes. Before placing them, old fillings, decay or the damaged structure is removed. Once your tooth is ready, the inlay or the onlay will be fitted and checked for proper fitting before being bonded. Once the dentist is satisfied with the fitting, the inlay or onlay will be bonded to your tooth with a strong resin. Copyright © 2016 Long Ridge Dental. All rights reserved.